We just had family pictures done and so far they look Amazing. Thanks to my wonderful friend Leilani Rogers! She is a lifestyle photographer and, as you will see, she does an amazing job. I really feel like she captured exactly what our family is all about. Can’t wait to see and share all of them! Go check out what she has so far for yourself (and her other great works) on her photography blog. Hello all. It’s been a while, but that is ok. Sometimes my real life is more important then my digital life. A lot has happened, and is about to happen! First of all, I am no longer a prisoner in my house. That’s right folks. I finally got my very own car. I now have full access to freedom. Alas that mostly means running errands. But at least I can finally run them! 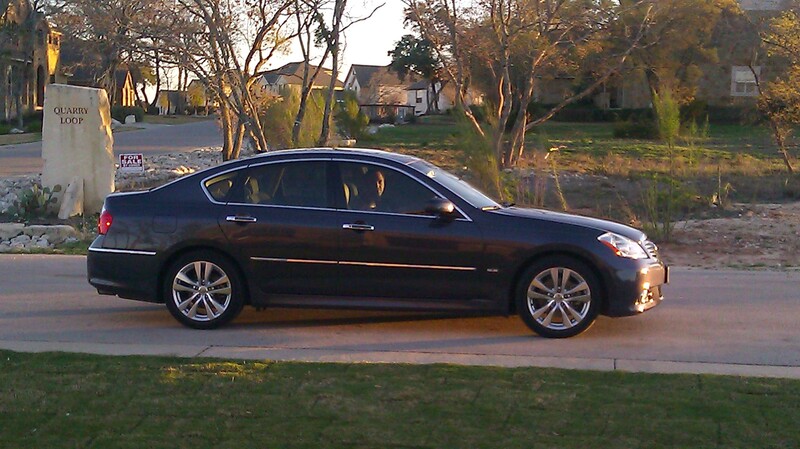 It’s a 2008 Infinity M35 and it’s a beauty too. I also did a little mini project that I have been meaning to share. It just took a while to have the final piece show up in the mail. A few weeks ago, Julie B. Beck came and spoke at a Womens Conference I attended. It was amazing! I learned so much and left feeling so motivated. It inspired me to change a lot of how I do things. Today I will share only one of the many many things I learned. Sister Beck spoke on how to prioritize. In our busy lives we have a lot to get done, but it seems we never have any time to do it. So she gave us an outline to follow. The Necessaries are the things that HAVE to get done to maintain a functional and healthy life. This is your work, exercise, grocery shopping, laundry, clean the bathroom. Stuff like that. The stuff that has to be done for daily functioning, but isn’t what we want to do. The Nice To Do’s are the things we would like to do. Our hobbies, reading, taking a nap. Going to lunch with your friends. Here is your mani/pedi. :-) Stuff like that. The stuff we usually do first, because we are trying to avoid doing the other stuff. Sister Beck challenged us that if we prioritized our lives in this way, then we would find that we would have time for all the Nice To Dos and each day we would feel spiritually fed and productive at the same time. Rather then carrying all this guilt over all the stuff we never get done. Well I took her challenge. I went home and the very next day I started organizing my daily lists. I am a list person! In fact, being a Graphic Designer, I literally made a list and turned it into a notepad. I prioritized it, as she said, and started checking things off in order. It doesn’t always lay out perfectly, some stuff on the Essentials can’t happen until later in the day, like Family Home Evening, so you move on and get some other stuff done. This is today’s list. You may have noticed I have “Make Bed” under Essentials. Well that is weird isn’t it. Unless you also heard Sister Beck talk about how when you get up in the morning and make your bed first thing, you are symbolically saying “I’m up, and I’m not going back.” Your are ready to start the day and begin serving. I liked that thought a lot. So I made it an essential to me. She also said that getting dressed first thing makes you ready for anything that comes your way. Well I run first thing, so I can’t exactly get dressed for the day first thing in the morning. So you will see that “Shower” is after “Run” under Necessaries. And yes, I do have to put shower on my list, or it doesn’t seem to happen. Before I know it, it’s 3pm and I am still in my sweaty running clothes. Since I started putting it on the list, I am getting ready much much sooner. I feel so productive each day and no guilt for missing anything important. I also have had time to get my Nice To Dos done. Not always, I will admit. Sometimes I have over planned my day. But I have not been bothered once by not getting a Nice To Do done, because I am so happy getting everything else done. So I wanted to share that little bit of advice with you. Let me know if you try it for yourself and if you see a difference in your life as well! Also if you are interested in getting your own To Do Daily Notepad, by tann|design (that’s me! :-)) contact me. If there is enough interest, I will set a price and we can put in an order. I have a few things like that up my sleeve and am eventually going to start a little store. So that’s why I am not giving it away for free. Sorry! Stay tuned next week when we reveal an awesome DIY daybed project we have been working on. 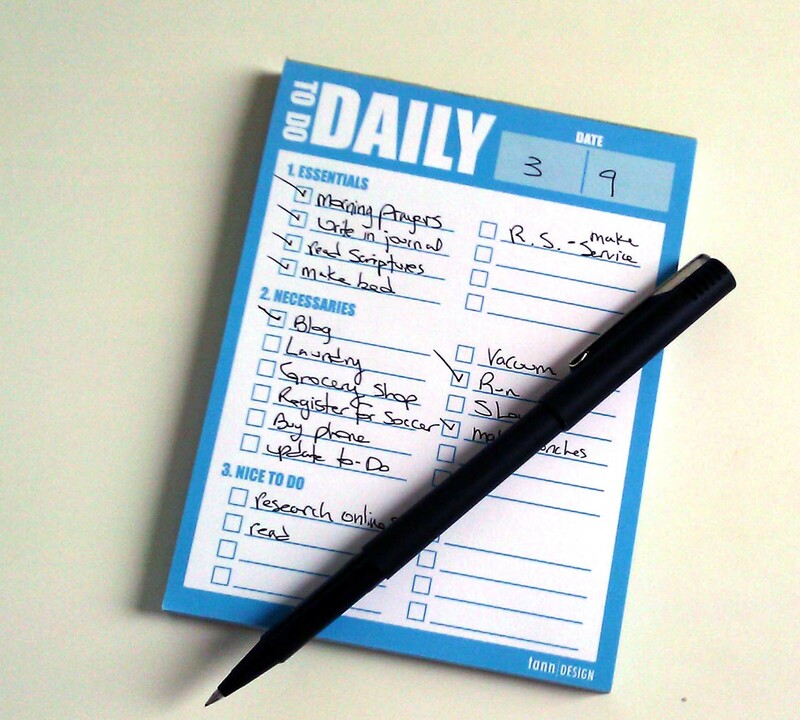 ***update** You can now purchase the To Do Daily Notepad at my etsy store! ****UPDATE TO THE UPDATE**** I have since closed the Etsy store. Just not enough traffic. Selling one notepad, once a month, is more annoying then beneficial. So if you would like one, just contact me and we will work something out directly. Thanks!